**A dramatic, illuminating day-by-day account of the 1978 Camp David conference, when President Jimmy Carter convinced Israeli Prime Minister Menachem Begin and Egyptian President Anwar Sadat to sign a peace treaty--the first treaty in the modern Middle East, and one which endures to this day. With his hallmark insight into the forces at play in the Middle East and his acclaimed journalistic skill, Lawrence Wright takes us through each of the thirteen days of the Camp David conference, delving deeply into the issues and enmities between the two nations, explaining the relevant background to the conflict and to all the major participants at the conference, from the three heads of state to their mostly well-known seconds working furiously behind the scenes. What emerges is not what we've come to think of as an unprecedented yet "simple" peace. Rather, Wright reveals the full extent of Carter's persistence in pushing peace forward, the extraordinary way in which the participants at the conference--many of them lifelong enemies--attained it, and the profound difficulties inherent in the process and its outcome, not the least of which has been the still unsettled struggle between the Israelis and the Palestinians. 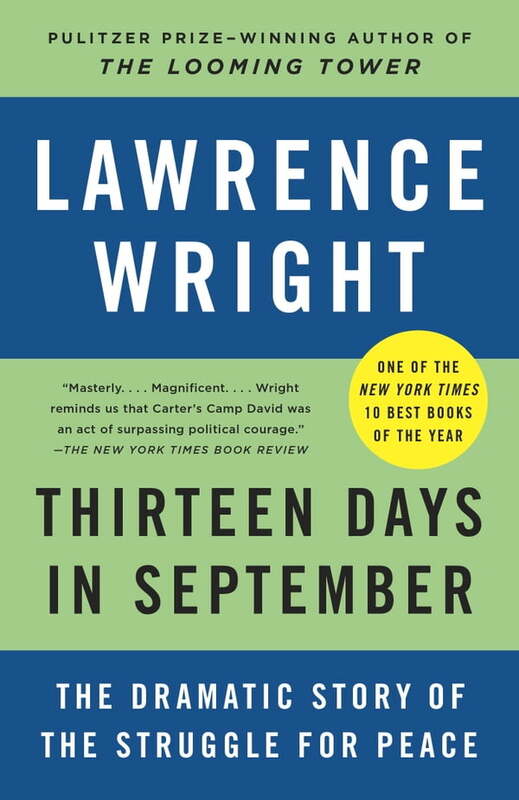 In Thirteen Days in September, Wright gives us a gripping work of history and reportage that provides an inside view of how peace is made.